Grass-Leaved Chickweed is perennial herb, with stems growing in dense tufts, slightly erect, quadrangular, 10-30 cm tall, slender. 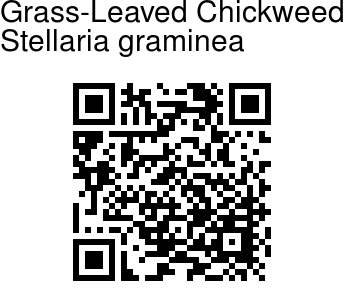 Leaves are stalkless, pinkish green, linear to lanceshaped, 0.5-4 cm x 1.5-3 mm, basal margin sparsely ciliate, base slightly narrowed, tip pointed. Flowers are many or sometimes few, in terminal or axillary cymes, 7-11 mm in diameter. Bracts are lanceshaped, 2 mm, midvein prominent, margin membranous. Flower-stalks are 0.5-2.5 cm, up to 3.8 cm in fruit, slender. Sepals are 5, green, lanceshaped or narrowly lanceolate, 4-4.5 mm or longer, shiny, 3-veined, tip long-pointed. Petals are 5, slightly shorter or longer than sepals, divided into two nearly to base. Stamens are 10, filaments threadlike, 4-4.5 mm, anthers brown. Ovary is ovoid-oblong, styles 3 or 4, about 2 mm. Capsule is ovoid-cylindric, much longer than persistent sepals. Grass-Leaved Chickweed is found in Europe, C. Asia, Himalayas, Siberia, Mongolia, Tibet, at altitudes of 3000-3200 m. Flowering: May-July. 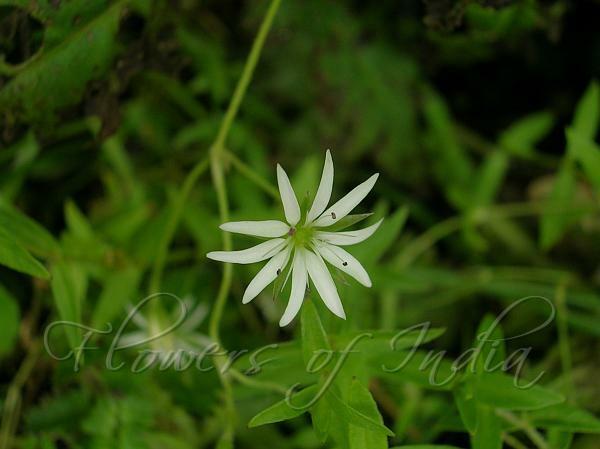 Photographed in Valley of Flowers, Uttarakhand & Narkanda, Himachal Pradesh.